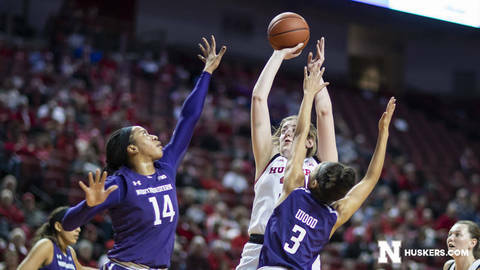 Nebraska overcame a 10-point second-half deficit to take a 54-53 lead with 37 seconds left, but Northwestern made the plays in the closing seconds to escape with a 58-54 women’s basketball win over the Huskers at Pinnacle Bank Arena on Thursday night. Northwestern sophomore Lindsey Pulliam, who finished with a game-high 21 points, scored 10 of the Wildcats’ 12 points in the third quarter, including a jumper with 4:10 left to give the Cats their biggest lead of the night at 33-23. The lead remained at four before Kissinger hit her only three of the night with 4:16 left to trim Northwestern’s edge to 49-48. Pulliam put the Cats back up 53-50 with a jumper, before Whitish tied the game at 53 with her final three of the night with 1:03 remaining. Although Northwestern was plus-10 on the boards, the Huskers answered by winning the turnover battle 14-8. Nebraska’s eight turnovers were a season best.